One of the most visited cities in the world and a true delight to see. This is France’s capital build on 7 hills and lays on the river Seine. 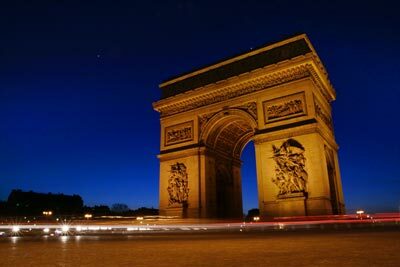 The Arc de Triomphe, the Louvre museum and the Eiffel tower are just a few of the many sites one can visit here. Paris, located along the Seine River and the cultural capital of France and the world, needs no formal introduction to the frequent visitor. Known for its romantic design and French style museums, Chateaus, statues and arches in the midst of the contemporary structures made in tune with modern engineering methods, Paris is one of the best preferred holiday destinations in the world. With our splendid car rentals, drive around this scenic city in style. There is no other landmark that best describes Paris than the Eiffel Tower. Located in the middle of the city, weighing over 4000 tons and towering to a height of 317 meters, a climb to the Eiffel Tower gives you a grand view of the city and its surroundings. This huge steel structure that never rusts despite the climate or erosion and weathering, has an indoor skating rink that is operational in the winter months. Our reliable car hire services can be used to tour about the city and get to other landmarks too, but none can beat the sheer awe you experience gazing at the Eiffel Tower. The Notre Dame Cathedral is famous for its Gothic paintings and was the subject of the ‘Hunchback of the Notre Dame’ novel by Charles Victor Hugo. The famous points in this Cathedral are the ‘Our Lady of Paris’ shrine, the ‘Virgin and Child’ painting and the treasure that displays several caskets and trinkets. Book yourselves a car hire package and we’ll take you around to the other Cathedrals as well. The Centre Pompidou is situated in the heart of Paris and is a highly acclaimed structure. It houses the Modern Art Museum on floors 1 to 4 and has spacious offices and other state chambers throughout. The museum is a marvel with many masterpieces by Matisse and Picasso. On the outside, you even find the beautiful Stravinsky Fountain amidst the lush lawns. Our car hire services help you explore many such avenues and promenades in Paris. The Bois de Bologne is a wonderful garden retreat right in the middle of the city, and hence called the ‘Lungs of Paris’. Its vibrant and colourful lawns with ornate shrubbery make it ideal for an evening stroll. You also have the Grand Prix race-tracks here where the Championships are held. Paris is a culturally rich city with a delectable cuisine; you must never forget to sample their wine. Explore Paris in all its glory with our unique car rentals. Some car rental companies have an office or desk in the arrival terminal of Paris which is indicated as On Airport. If the car rental company does not have an office or desk at the arrival terminal it is Off Airport, which means that most of the time the car rental supplier provides a free shuttle bus from the airport to the car rental desk. When traveling we advise to carry some Euros to avoid any unwanted surprises. At all Airports of Paris there are Money Exchange offices in order to change your local currency. Rentalcargroup.com offers car rental in more than 35000 locations, at all major airports and cities and railway stations. Below on this page you see a map with all the car rental companies we work with in Paris Charles De Gaulle Airport. Last month, the average car rental length at Paris Charles De Gaulle Airport was 6 days. The average rental car length at Paris Charles De Gaulle Airport is 8 days. The most booked rental car type currently at Paris Charles De Gaulle Airport is COMPACT cars. Last year, the most booked rental car type at Paris Charles De Gaulle Airport were ECONOMY cars. How much does it cost to rent a car at Paris Charles De Gaulle Airport? Last month, the average car rental price was 225 USD. Last year, how much did it cost to rent a car at Paris Charles De Gaulle Airport? Last year, the average car rental price was 403 USD. What is the current average daily price to rent a at Paris Charles De Gaulle Airport? Last month, the average rental price was 38 USD per day. How much did it cost to rent a car at Paris Charles De Gaulle Airport over the past 12 months? Last Year, the average rental price was 53 USD per day. The car rental companies available at Paris Charles De Gaulle Airport are: Alamo, National, Enterprise, Firefly, Interrent. See below last 5 customer reviews. Our customers rated Paris Car Rental with an average of 9.50 based on 8 ratings. The level of service by the staff of enterprise at charles degaulle airport is the best i've experienced any where. they were professional, friendly and efficient. highly recommend them. From picking up the car to dropping it off, staff were extremely helpful and courteous. overall a fantastic experience that i will be using again - excellent value for money!